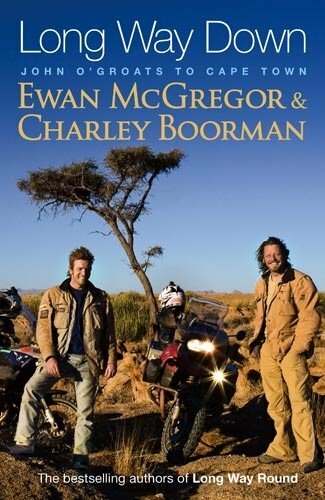 Ewan McGregor and Charley Boorman’s Long Way Down was just every bit as good as their first trip by motorcycle, Long Way Round, which took them on an adventure around the world. On this trip, much like going from London to New York, the duo went from the northernmost point in Scotland to the southernmost tip of South Africa by motorcycle. They covered some extremely treacherous roads, seemingly constantly needing to repair their bikes due to the wear and tear, and had some amazing adventures, encounters and moments throughout. I was hooked on the first page and was rivted throughout the book. I loved every minute of it and truly hope they go on another adventure, as they joke at a couple of different points throughout the book. I have no doubt in my mind that it would be every bit as good as the first two. The only difference with it is that I wouldn’t wait for it to come out on paperback. The riders make several stops on their trip, which they discuss in detail throughout the book, that are for charity. They want to raise awareness for the difficulties that others experience throughout the world and that there is a way for others to help. The three main organizations they work with are UNICEF, Riders for Health, and Children’s Hospice Association Scotland. Please take a look at the sites and help if you can. The book has inspired me to do so. It is truly an excellent story about their ride and their experiences along the way. I’m really quite amazed that they were able to condense it down to such few pages. It seems like there could be another whole book, at least, just from what was most likely left out. For instance, McGregor and Boorman talk about some arguments they were having and how everything was settled after Addis Ababa. Yet, in the beginning, I never got a good sense as to what the differences were they were arguing about. It didn’t bother me that I didn’t know, especially after reading about it in the first book, but it makes me wonder about what didn’t make the cut. Long Way Down, as well as Long Way Round, are two of the best travel books I’ve ever read. I put them right at the top of my list with Bill Bryson as I am now definitely a fan for life. Thanks for sharing your great adventure guys!